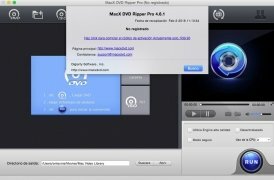 MacX DVD Ripper Pro is a simple multimedia tool with which you can rip the content of any DVD from your Mac computer and, therefore, create backups of your optical discs in any format. Thus, in a few seconds you'll be able to convert your DVD to any file format, even the most appropriate ones for mobiles, whether Android or iPhone. Don't lose any memories or valuable software due to a damaged DVD. Create backups of your optical discs to prevent damage due to scratches. Convert your DVD t0 MP4, H.264, MOV, M4V, FLV, MPEG4, AVI, QT, MP3, etc. 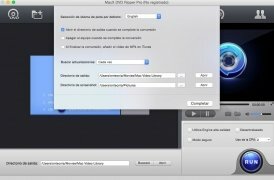 Make your video files compatible with iPhone, iPad, Android or Apple TV. Load the DVD by clicking on the corresponding icon. Choose the output format among all those that are available. Press the Run button to start the conversion. This is a trial version with you can rip DVDs for 5 minutes.